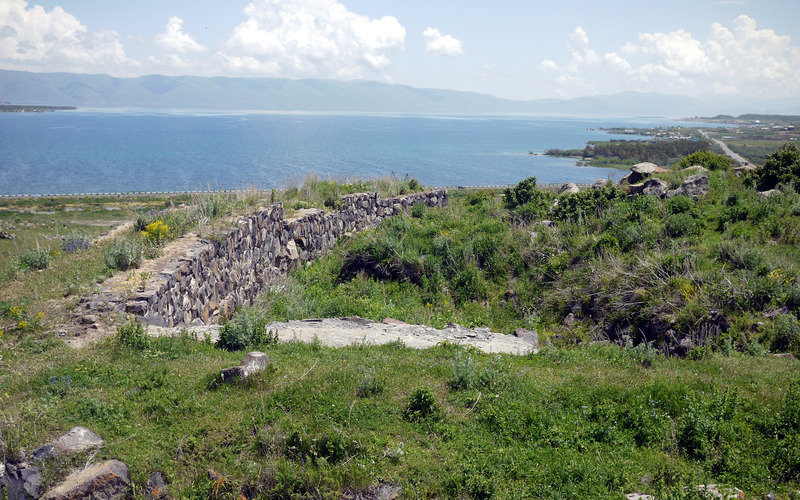 Lake Sevan, as seen from the Lchashen hillfort. The walls in the foreground are the rebuilt walls of the hillfort. In 1910, the great Armenian engineer Alexander Asaro had a bright idea. 90% of the water of Lake Sevan was being lost through evaporation. Why not therefore reduce the level of the lake, and use the water extracted for agriculture – and at the same time expose a wide swathe of fertile ground around the lake. His ideas languished at first, but in the 1950s and 60s when Armenia had become part of the Union of Soviet Socialist Republics, that great planner and master designer Joseph Stalin decided to put the idea into operation. Indeed, inspired by this, he had other bright ideas, notably as regards the Aral Sea. Here he successfully diverted the waters of the main rivers flowing in, the Amy Darya and used the water for crop fertilisation, so that today Azerbaijan is one of the world foremost producers of cotton – and the Aral Sea has been reduced to a mere 10% of its former size. Stalin’s other great plan, to reverse the flow of the river Ob, the 7th longest river in the world – which today flows uselessly into the Arctic Ocean, so that it flowed more usefully into the Aral Sea, never came into being. But when Stalin died, many of his boldest ideas perished with him. However the plans for Lake Sevan were at least partially successful and the level has been reduced by nearly 15m and as a result generates much electricity. Among the benefits from the lowering of the levels was the benefit to archaeology. Lake Sevan, which is said to be the third highest lake in the world, is the only large expanse of water in landlocked Armenia. However when the level was reduced, a very extensive barrow cemetery was revealed at Lchashen (pronounced ‘Lachashen’). 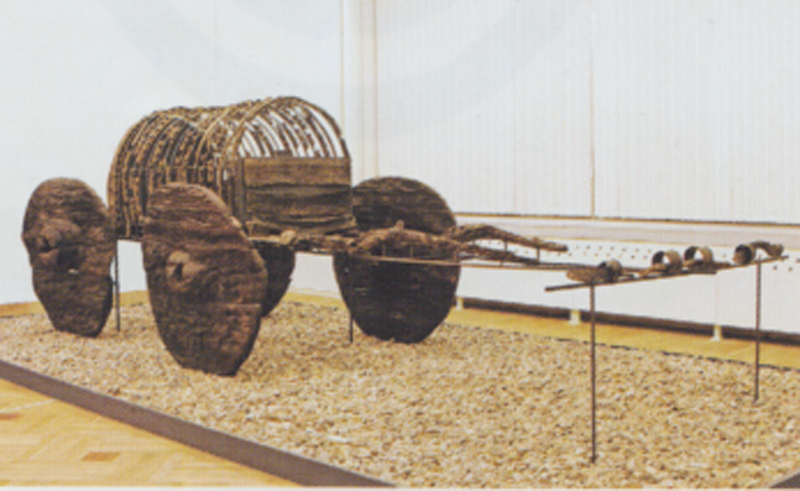 The contents included a number of wooden chariot burials, but because the land had been flooded, the wood was preserved, so as a result, the National Museum of Armenia in Yerevan has the finest collection of Bronze Age chariots in the world. The site of the Lchashen cemetery. 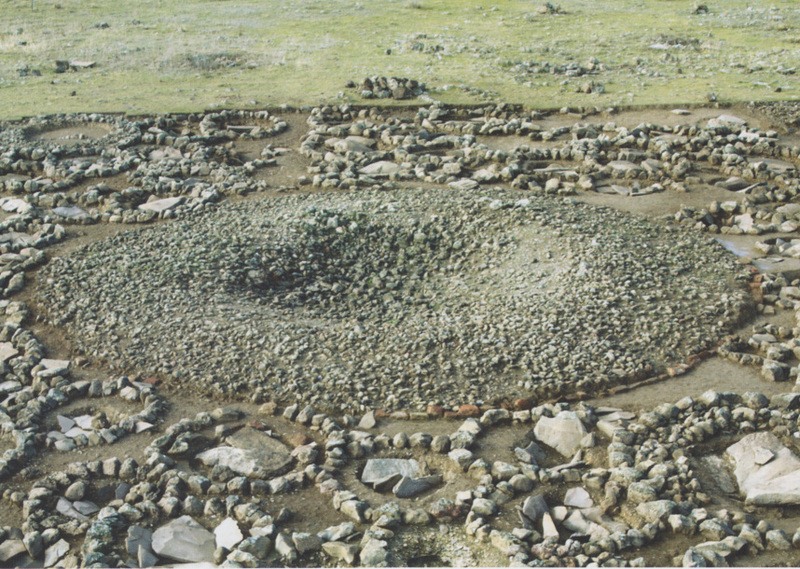 In the foreground, the ring of stones presumably marks the kerb of one of the barrows. Two of these carts are on display in the National Museum and make one of the more spectacular displays. One of the four-wheeled wagons was a covered cart with the semicircular roof made out of withies still preserved. At the time, Prof Stuart Piggott was fascinated and included them in his classic book on The Earliest Wheeled Transport. Above. The finest of the wagons recovered from Lchashen. The four solid wheels are made from three planks of oak, while the interior is covered by a covering of withies. Note to the right the yoke, showing that it had been pulled by oxen. Right. One of the sculptures from from Lchashen. Does it show a chariot with the horses at the left, while to the right two figures are riding in a chariot with spoked wheels? 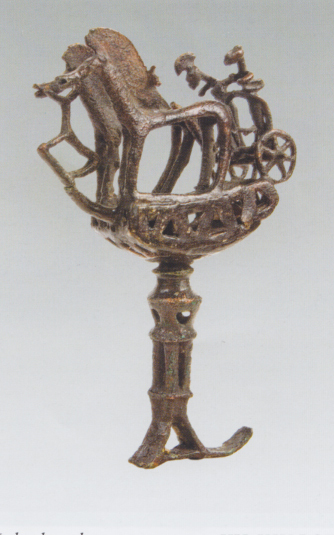 If so, this would be among the earliest evidence for the use of chariots, presumably in warfare. 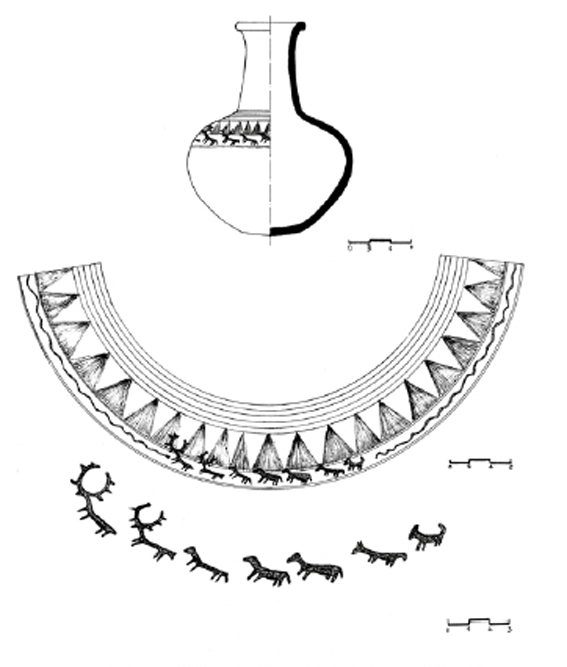 The Middle and Late Bronze Age marked a sharp difference from the earlier Shengavit culture. Old sites are mostly abandoned, and new sites begin. The main feature was the advent of large numbers of sometimes very rich burials often covered by large barrows known as Kurgans, the actual burials being made in deep pits, called pit burials. 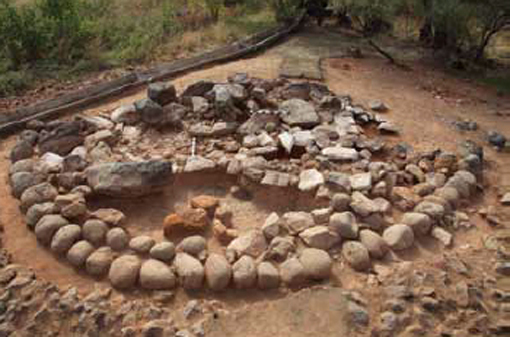 Some of these burials contain the remains of wagons or carts. The earlier ones were four wheeled wagons, presumably hauled by oxen, the later ones were chariots pulled by horses. It is a matter of considerable debate as to when the changeover took place, and when horse drawn chariots were first introduced. There is much discussion as to how far these changes, particularly the introduction of the Kurgan burials and the wagons come from the north, from Russia where Kurgan burials had long been established. Traditionally this was seen as the coming of the Indo-Europeans though modern discussion is far less certain about this. The type site for this period is Trialeti in Georgia to the north, where forty two barrows were excavated from 1936 – 40 in advance of a hydroelectric scheme, and a further six were excavated from 1959 – 62: the ground was waterlogged, and the remains of two wagons were preserved in pit graves, with traces of two others. The earliest progenitor of this period is a huge burial excavated at Maikop in southern Russia in 1897 with a rich assemblage of material including two golden bulls and two silver vessels with animal friezes. The Bronze Age of the Caucasus can be divided into two parts, the Middle Bronze Age from around 2,500 to 1500BC, and the Late Bronze Age from 1500 down to 900 BC. 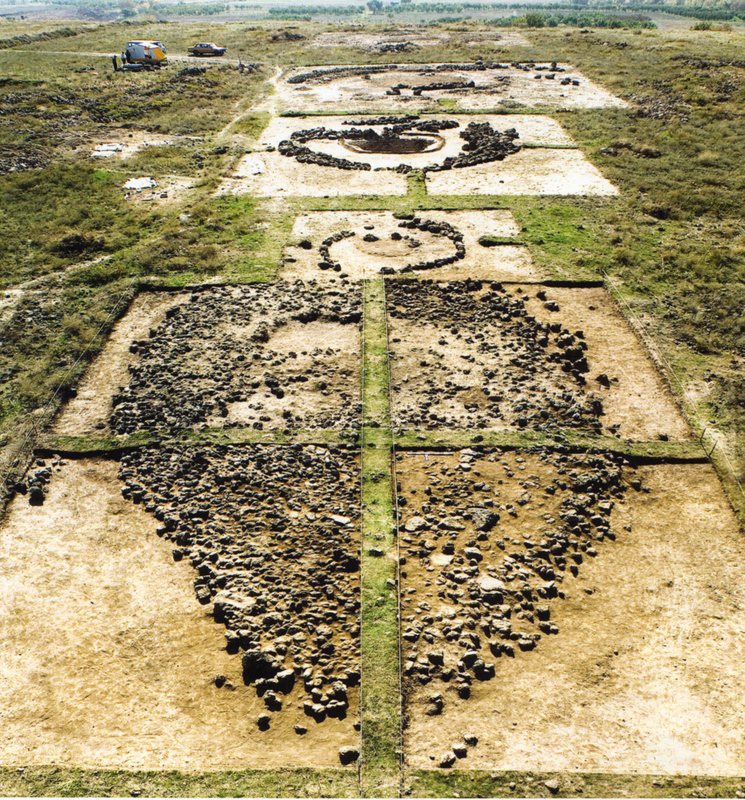 The earlier part contains a number of very rich burials, but the actual cultures appear to be localised, as if there was a number of rich chieftains, all trying to outdo each other in the lavishness of their funerals. One of the richest cemeteries of the earlier part of the Middle Bronze Age, around 23rd to 21 centuries BC, was that excavated at Karashamb. The main tomb (right) was surrounded by numerous satellite burials. The superb silver cup (of Iranian origin???) 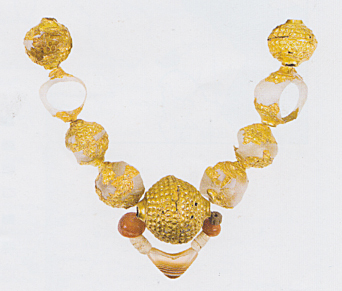 is now one of the treasures of the National Museum. Above. 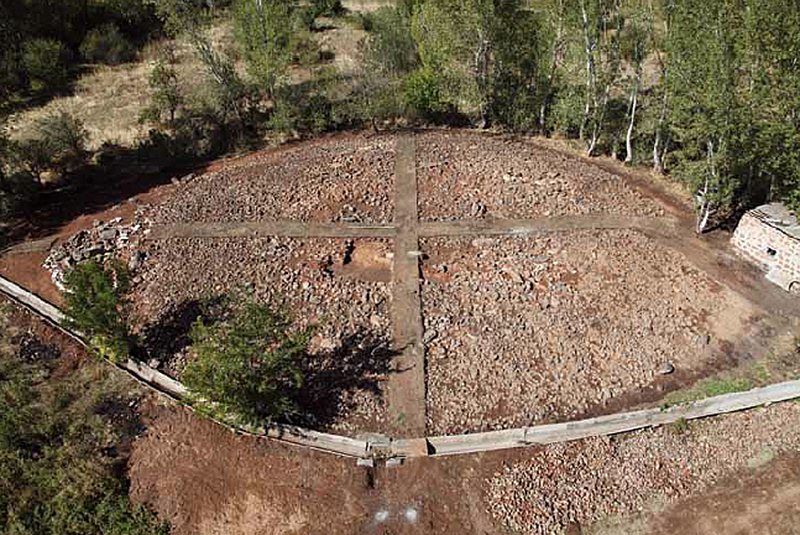 The central, presumably royal, burial from the Karashamb cemetery, surrounded by small satellite graves. Were these of retainers? Or were they sacrifices to accompany the burial of the king? Right. 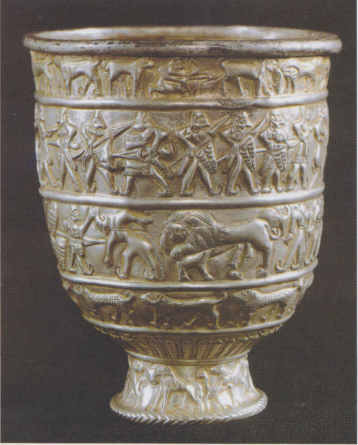 This superb silver vessel found in the Karashamb cemetery may have been made in Iranian or in Babylonian workshops. 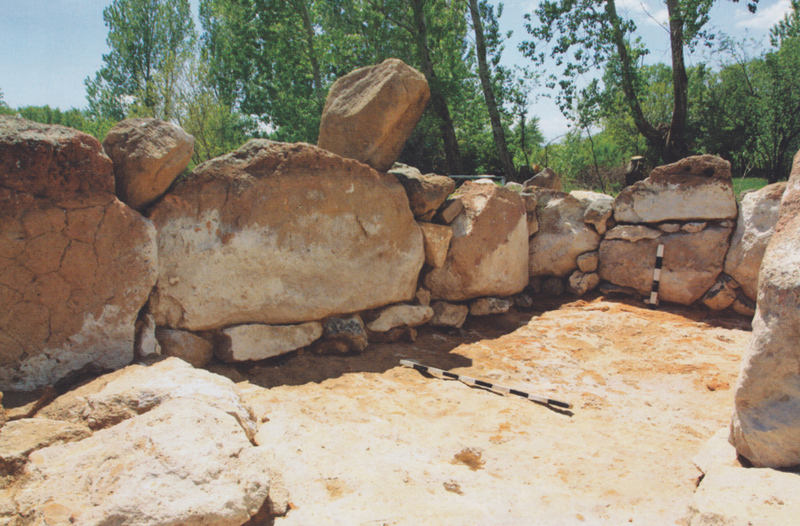 However Hakob Simonyan has been excavating a similar cemetery of the 23rd to 20th century BC at Nerkin Naver (Upper Naver) where a fine range of pottery was discovered. This is one of the treasures of the National Museum and is generally interpreted as being a model of the solar system (use your imagination!). 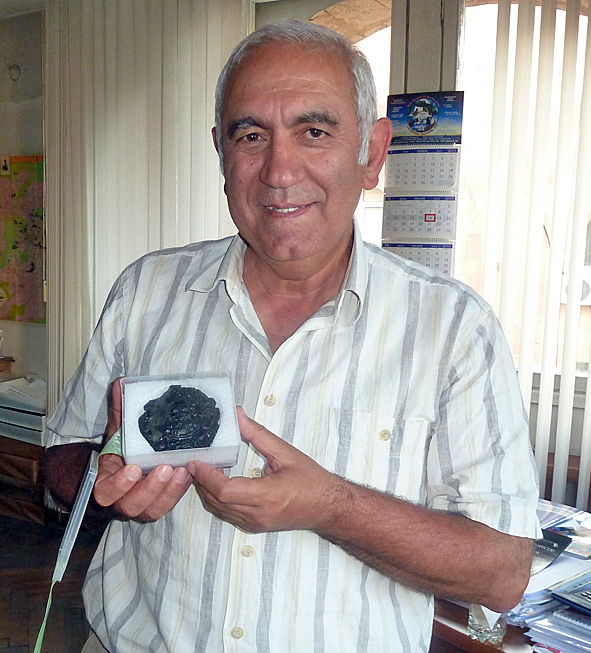 It is a casual find from an unknown source, but is generally considered to be Bronze Age. In the Late Bronze Age it begins to come together and a far more homogenous culture came into being. This is the main period of the Lchashen cemetery but Hakob has been excavating a very rich site at Verin Naver, which must not be confused with nearby Nerkin Naver, because the one is Upper Naver, and the other Lower Naver. Hakob has been excavating the cemetery since 1976 but in 2012 he found that the largest kurgan (barrow) of all lay in the line of a new road, so he just had to excavate it. This was over 50 m in diameter and 2 metres high, and proved to cover a very rich chariot burial. There were in fact two burial chambers, one at the centre, and a second added on at the side like a sort of pimple (I assume it was later). This smaller barrow can be seen to the left. This smaller chamber was surrounded by a ring of river boulders and had a sort of mini V-shaped dromos (entrance). At the centre was the burial chamber with a rich cremation accompanied by exotic gold jewellery, carnelian beads, and Egyptian faience, demonstrating the large-scale of international trade or rather gift exchange at this period. There were also some highly decorated black burnished bowls. Here we see one with a burnished frieze showing dogs chasing deer. The main chamber at the centre of the mound was approached by a passage way. The central chamber, which was cut into the bedrock, and survived to a height of six or seven rows of tuff slabs, was built round the chariot. 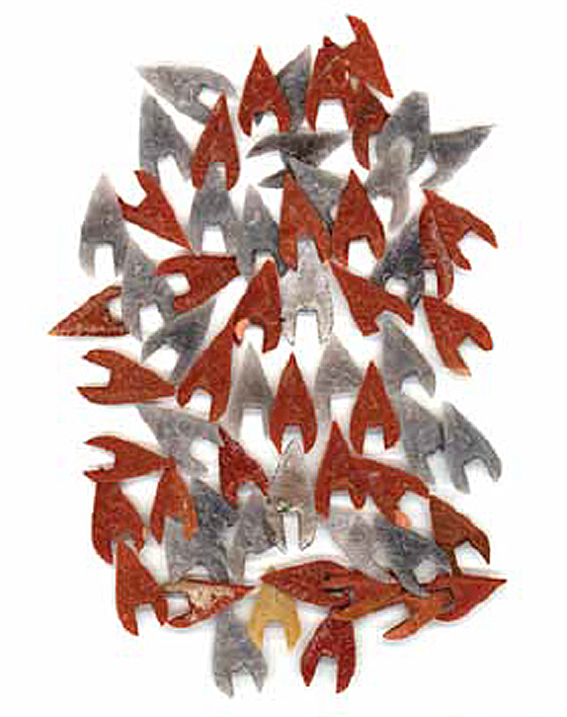 Left is this superb collection of coloured arrowheads, which were presumably the tips of arrows that were placed in a quiver fastened to the side of the chariot of which two bronze rings survived. Above. 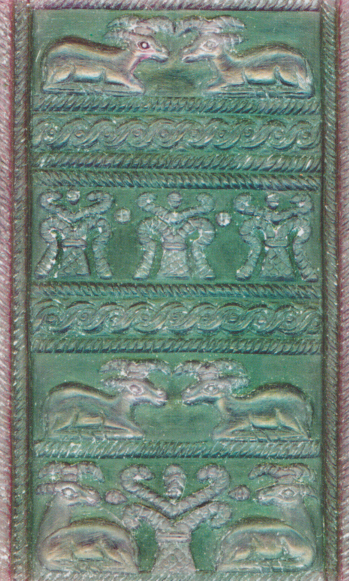 Bronze plaque from the tomb. 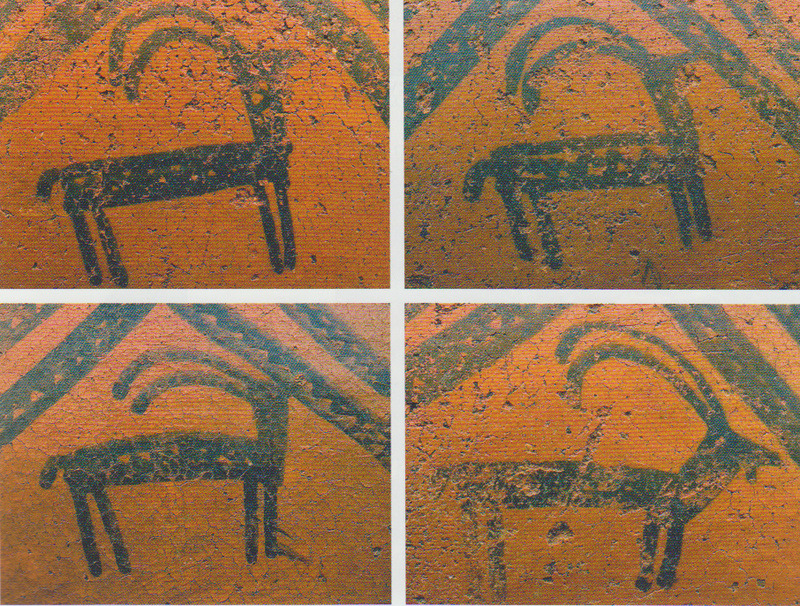 The lower register may possibly show the lord of the beasts, a central figure being worshipped by beasts on either side. But the greatest treasure of all was the remains of the crown or chest piece that lay under the cremation at the northern end of the chariot. 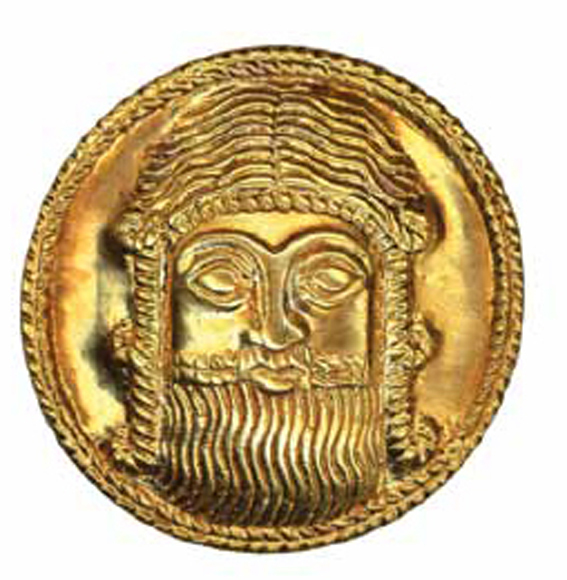 This consisted of five medallions, made of bitumen but fixed in a circular bronze frame and covered with gold foil. Since all that has survived is the black bitumen, they cannot really be appreciated so a modern replica has been prepared showing a bearded man with ringlets. 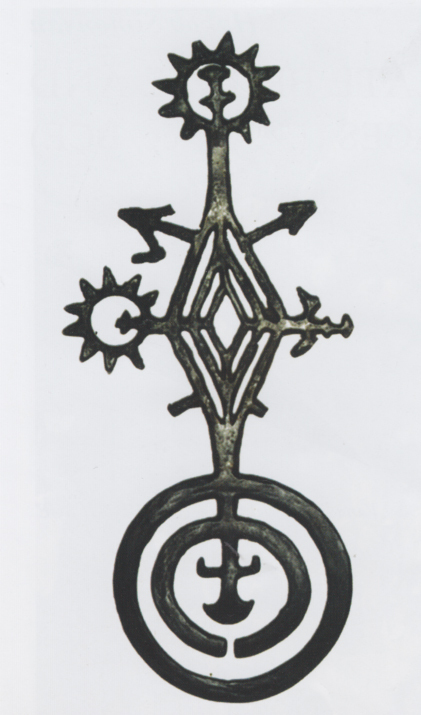 One of the other medallions has a man surrounded by a circle of animal figures including a pair of rams lying on both sides of a tree of life. Five other such medallions are known having appeared in the antiquities market: the BM, the Louvre and the Met all have one. They are usually attributed to south western Iran during the Middle Elamite period, but this is the only one from a secure archaeological context. Should they all be considered to be Armenian? The centralising tendencies of the Late Bronze Age also saw an increase in the number of fortified sites – hillforts perhaps. These had begun in the Middle Bronze Age and were to reach their peak in the succeeding Urartian period of the early Iron Age. 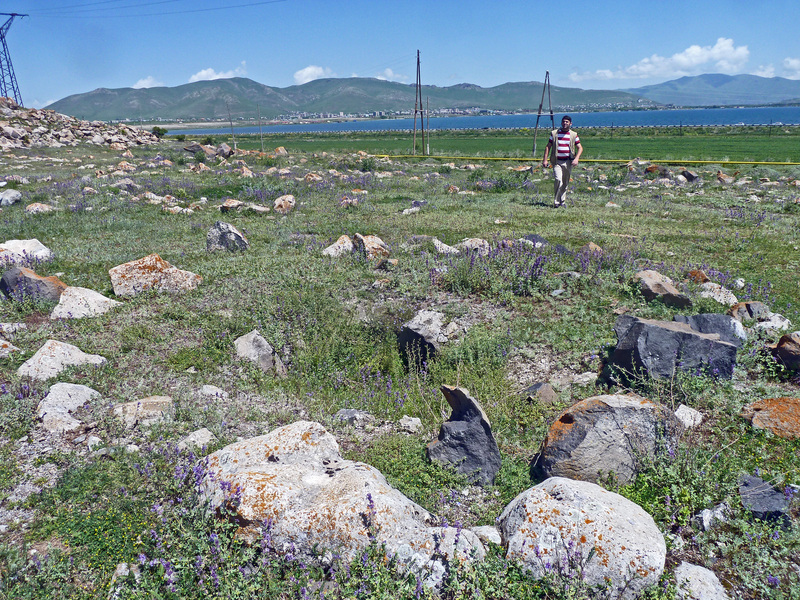 We visited a fine example at Lake Sevan where we scrambled up a steep hillside to find the hillfort at Lchashen, overlooking the burial site. This concludes discussion of the Bronze Age; now onto the Iron Age when Armenia was part of the Urartian kingdom. 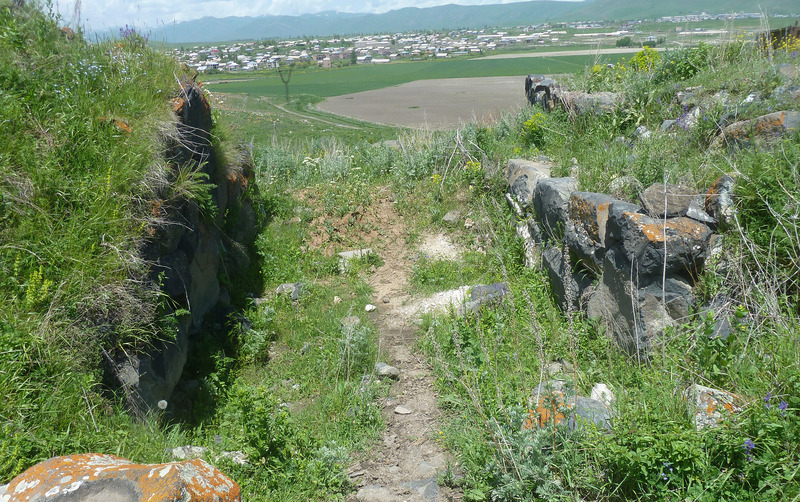 This is considered to be the predecessor of greater Armenia and we look at the great fortified towns of Erebuni and Karmir Blur View through the gateway of the hillfort at Lchashen. There is a road that leads down to the left. Lake Sevan lies to the right. In the distance is the holiday resort of Sevan.